Chairs, chairs, chairs. They’re an addiction of mine and if I had my very own way (I’m working on it :-)) I would have a house full of non-matching chairs. You can see my chair obsession on Pinterest (check out the black and white striped one). So what about wedding chairs? What do you do with them? Do you decorate or save your budget for something else. And what about a lounge area? Have you thought of creating a funky area for your guests to lounge about? Guest Blogger, Stacey-Marie Chalk from Cherry Topped Bespoke Weddings has some frabjous advice and very smart ideas for your wedding chairs. Trying to think of ways to make your wedding look and feel a little different? Then why not get creative with your chairs! 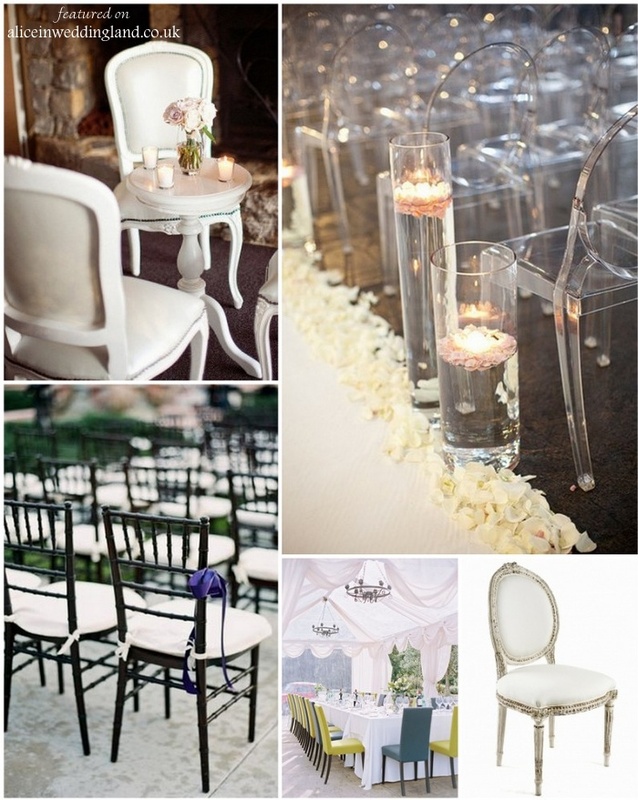 When visiting your wedding venue, take note of the chairs they have and whether they have the potential to be accessorised to suit your wedding style. If the chairs aren’t really suitable, ask your venue if they can store the chairs somewhere and if it would be ok to hire in alternative seating. By spending a little thought on how to make sure the chairs complement your overall design, you can really make an impact in your ceremony and your wedding breakfast rooms. 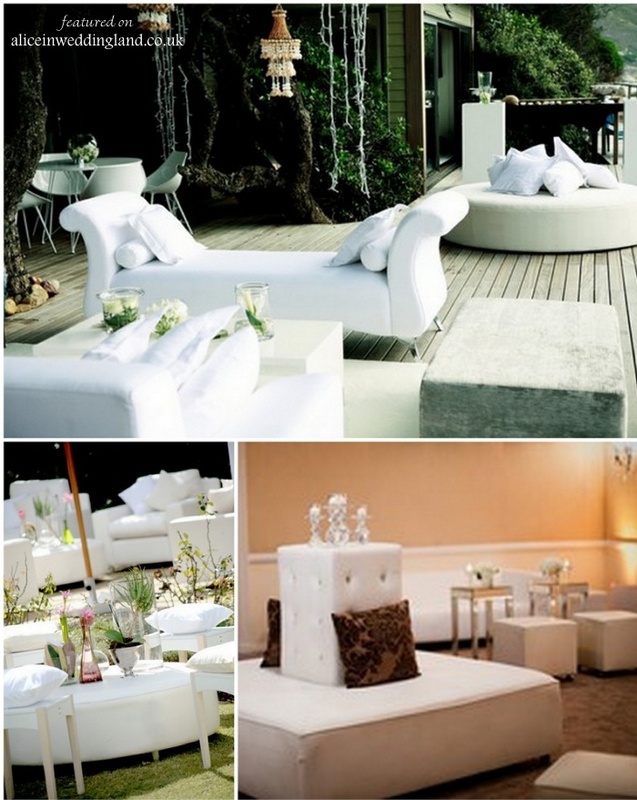 You could also create a relaxed and stylish chill out area or a trendy city bar feel by hiring in lounge furniture. Think about the colour, material, style, shape and potential for adding decorative elements such as flowers, stationery, ribbons, fabric, fruit etc. Do you have any favourites? 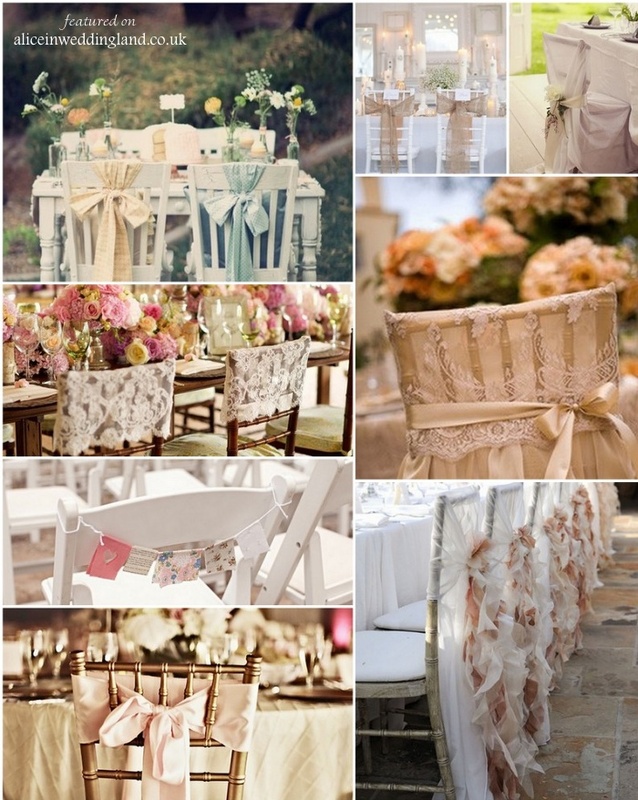 Have you already started to think about how to bring your wedding chairs into your design? 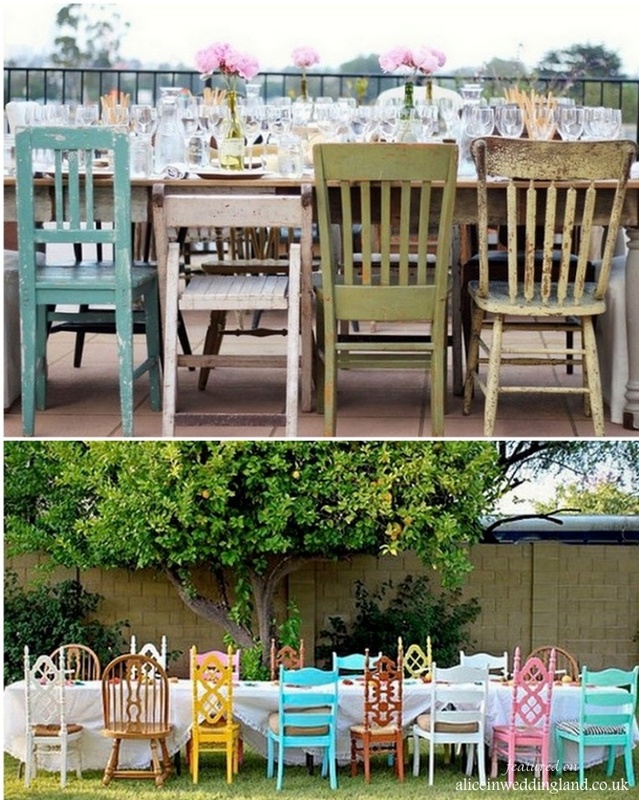 Have fun getting creative with your wedding chairs! Some amazing ideas here! It’s so tricky putting a personal stamp on mass-hired chairs, but there are some wonderful solutions here! Love these ideas! 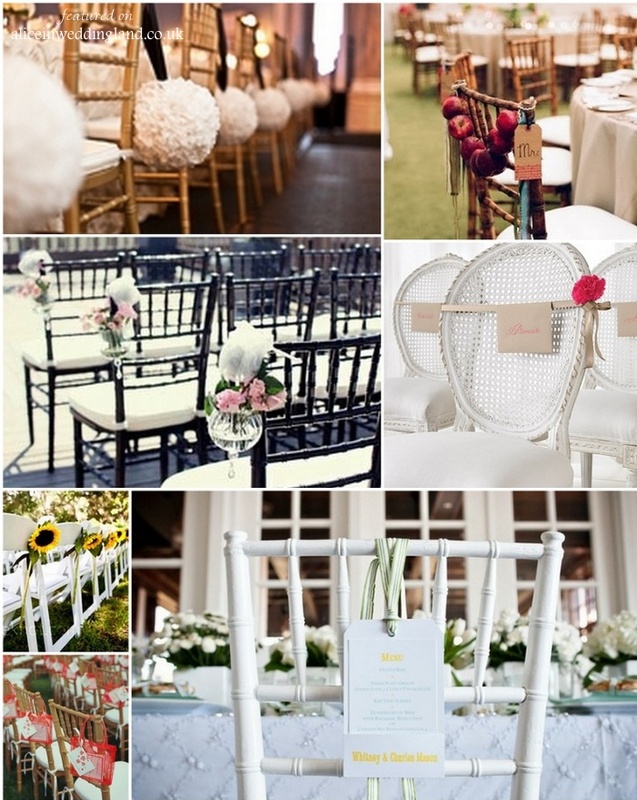 Unique chairs are always amazing for weddings – hate the cookie cutter options. These are very creative ideas — they can really add so much to the ambiance! Awesome ideas. 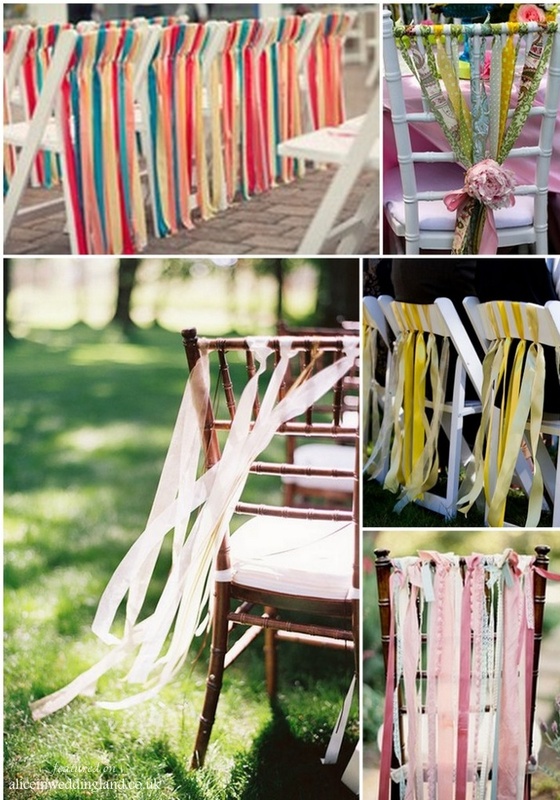 The ribbons on the backs of the chairs add so much color.